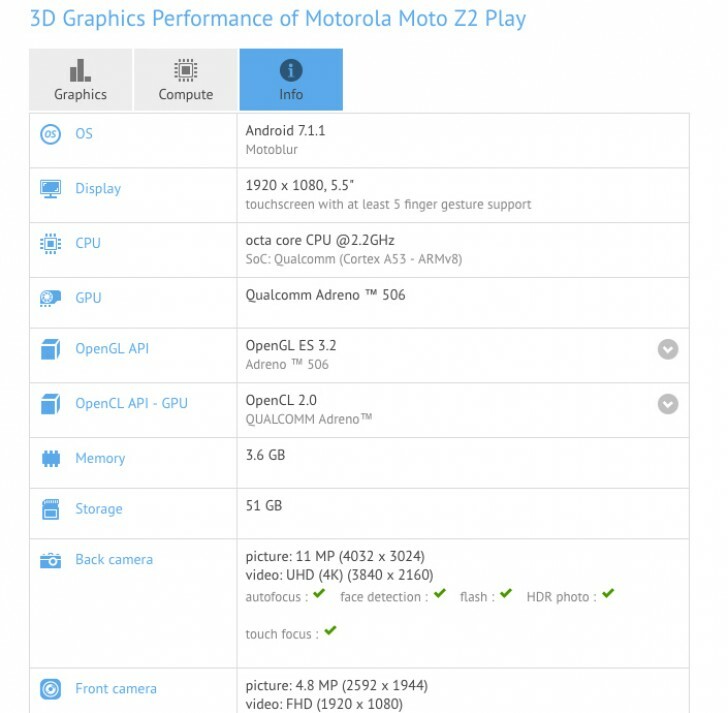 After already having been certified by China’s TENAA, the upcoming Moto Z2 Play thought it would be wise to have a go at GFXBench. As such, the phone’s most important specs have been outed once more, basically confirming what the TENAA listing has already told us. While GFXBench’s info screen doesn’t list battery capacity, it’s important to note that Lenovo itself (Motorola’s owner) has confirmed that the Z2 Play will come with a 3,000 mAh cell. That’s down from the 3,510 mAh unit inside its predecessor, the Z Play, which was widely hailed as one of the champions of battery life in 2016. That certainly won’t be the case for the Z2 Play, unfortunately. The next Play model will sport a 5.5-inch 1080p touchscreen too, but changes things in the camera department. Gone is the 16 MP snapper of the Z Play, and in is a new 12 MP sensor on the rear. On the front the same 5 MP unit should be sitting. The Moto Z2 Play will be powered by Qualcomm’s Snapdragon 626 SoC, a minor improvement over the SD625 inside the original Z Play. RAM will be 4GB, and built-in storage 64GB, probably expandable. The new device runs Android 7.1.1 Nougat. So when should we expect it to finally become official? The date could be June 8, as revealed by leaked press renders of the Z2 Play last month.